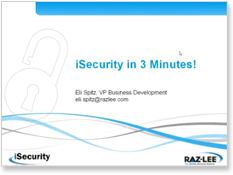 Raz-Lee Security Inc., a supplier of information security and compliance solutions for the IBM i, announces that IBM has certified iSecurity for integration with IBM's Tivoli Netcool/OMNIbus, part of Tivoli's Security Operations Manager, to consolidate complex IT and network operation management tasks. The integration with Tivoli's SIEM capabilities will enable it to receive syslog realtime alerts from iSecurity and to consolidate security event information from other IBM i servers, as well as from multiple hardware platforms, into its single console environment. The new Tivoli certification is in addition to Raz-Lee's existing SIEM partnership agreements with RSA enVision, Q1Labs (purchased by IBM), and GFI. Raz-Lee also says it has extensive in-the-field experience with SIEM products such as Arcsight, HPOpenView, and CAUniCenter. See more details on the iSecurity-Tivoli Netcool/OMNIbus integration. See more details on the IBM Tivoli Netcool/OMNIbus Certification.